Fiber Tech is a part of one of the fastest Growing Business group having group turnover around 700 Cr and is having vast experience in the field of Cement, Diesel Engine, Construction & Infrastructure, Decorative Laminates, Cottan Ginning, Hydraulic Systems, Earthmoving machinery and agricultural Equipments. Such a vast experience of different fields has provided us the Fundamental understanding of specific business challenges which is faced by any global company in today’s world. Our range of PP/FRP & FRP TANKS starts from 100 ltrs to 100 kl capacity. Our scrubber system range starts from 1000 M3/HR TO 60,000 M3/HR, DUCTING DIA from 300 mm to 2000 mm. FRP pipe is from Diameter from 100 to 1600 mm, lengths of 6, 12 mtrs, and pressures from 1 to 20 bars. We are also manufacturing FRP PULTRUSION PRODUCTS like gratings, cable trays, rods and structural profiles like angles & channels. FRP Pultrusion products have wide applications in electrical industries for electrical insulation purpose, corrosion resistance and thus longer service life. FRP Pultrusion products are also very popular in chemical and other chemical processing industries where corrosion to the metal parts due to hazardous gases is a critical problem. Fiber Tech is spread over 15 acres of lush green land. 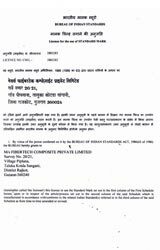 Fiber Tech is having covered manufacturing area of 33,000 Sq. Ft. in addition to 10,000 Sq. Ft. of raw material storage area. Fiber Tech is also having administrative office area of 4,000 Sq. Ft. with all basic amenities, latest computer systems and Broad band internet facility. 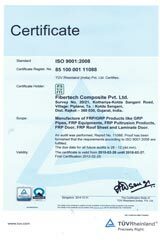 FIBERTECH COMPOSITE PVT LTD committed to offer you high quality GRP PIPELINE AND PP/FRP AND FRP EQUIPMENT AND FRP PULTRUSION PRODUCTS for longer service life. We hope you will consider as potential supplier for your requirements. We assure you of our best attention and services all the time.